Growing: Â Jaco marijuana seed, a strain from the breeder KalySeeds, is a mixture of PAC-OLY P4/w and a sativa strain from India bred in Germany for 40 years called Dady. This Dady strain is the reason why you can harvest Jaco in early October. This Sativa strain loves the outdoor climate and the sun. When you sow it by May, it will be ready for you to harvest by the last days of September or mid-October. A generous yield of up to 800 g is expected from this cannabis seed and more can be attained through careful cultivation. It can have a probable height of 2m â€” 4m. It needs a moderate demand of water and have a resistance against mildew and spider mites. Ganja growers will certainly fall in love with its great taste regardless of its cat piss-like scent. This strain is perfect for a whole day smoking and for relaxing after a whole day at work. Nice weed… not expensive either. Got this as a freebie when I ordered SWAG. I grew it indoors and it produced ok. Just be careful… it smells quite strong while flowering. The description is correct… like cat-piss but with more skunky (but not pure skunk). Still have some beans left… will probably do another grow over the summer. 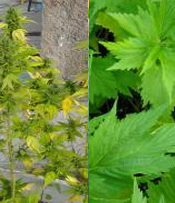 While growing, you can leave this stuff outside in pots… difficult to identify this as weed if it’s among other plants in your garden… once it starts flowering… it looks a lot more like weed and would probably not fool a neighbor who has seen cannabis growing before.